Bamboo shoots are the sprouts which spring out beside a bamboo plant. These shoots or sprouts are edible and consumed in many Asian countries. When properly refrigerated, fresh bamboo shoots can last for up to two weeks. Bamboo shoots are low in calorie and sugar content. It has a negligible amount of fat, high in protein, packed with vitamins and minerals, high in dietary fiber, and has appetizing effects. Research shows that the leaves of bamboo sprout consist of phytosterols, such as amylase, chlorophyll, and flavone. Out of these, chlorophyll have shown properties which can control mutations and cancer. Bamboo shoots are an ideal food for those people who want to lose weight as it contains low levels of calories, sugars, and carbohydrates. Bamboo shoots have phytosterols and phytonutrients, which are ideal for dissolving harmful LDL cholesterol in the body. This causes a smooth supply and movement of blood throughout the body as it eases cholesterol out of the arteries. High amounts of potassium are found in bamboo shoots. Potassium is highly beneficial as an electrolyte and is also very good for lowering and maintaining blood pressure. Various vitamins and minerals in bamboo shoots can help improve the body’s immune system. It has vitamins, minerals, and antioxidants that as essential for strengthening the body from inside-out. Due to the high amount of dietary fiber in bamboo shoots, consumption of it is essential for easy digestion and healthy bowel movements. Traditional Chinese medicine believes that bamboo shoots can cause uterine contractions. During the last month of pregnancy, bamboo shoots are used as a medicinal supplement when the delivery date is still pending. Bamboo shoots have been effective against respiratory disorders. A decoction of the shoots can be prepared by boiling them twice. The first boil should be for 5 minutes followed by a second boil for about 10 minutes. You can add some honey for the best results. Research conducted by Muniappan and Sundararaj has shown that bamboo shoots possess analgesic (pain-killing) and anti-inflammatory properties. 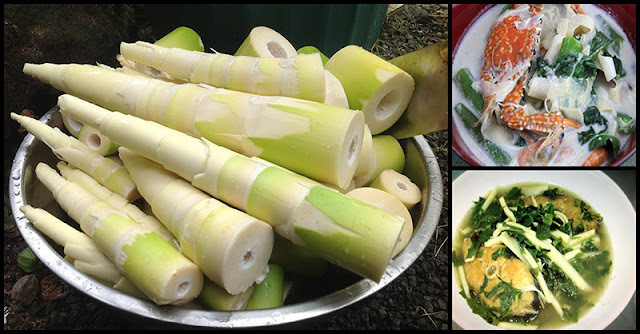 Juice extracted from bamboo shoots can be used as medicine for ulcers and external wounds. In Ayurvedic medicine, it is believed that bamboo extracts contain anti-venomous properties, thus making it useful in both snake and scorpion bites. Bamboo shoots are also used for cleaning sores and wounds. Bamboo shoots are useful in treating stomach disorders. Bamboo leaves are also a good remedy for intestinal worms.